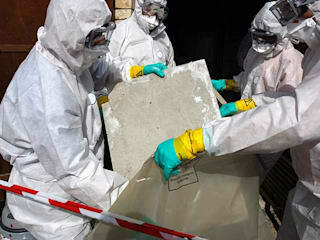 The Asbestos Removalists provide a complete array of asbestos services throughout the UK. Whether you are looking for asbestos removal, or a survey, our qualified and licensed contractors can provide a high quality service. Not only do we provide a professional service, we also pride ourselves on competitive pricing. We work with both commercial and domestic clients to deliver the work you need done. Asbestos Removal - As our name suggests, we are professional asbestos removalists. We can ensure that all the dangerous materials are correctly and safely removed. After removal, air testing is conducted, ensuring the property is safe for inhabitants. Asbestos Surveys - If you suspect a property may contain asbestos, you can have an asbestos survey carried out. This will involve examining your property, and determining the next steps, if asbestos is discovered. Asbestos Disposal - It is important that asbestos is correctly disposed. Our asbestos disposal service will ensure the asbestos is correctly disposed of, and will not pose any risk to future generations. Asbestos Encapsulation - As well as asbestos removal, we can also provide asbestos encapsulation. This involves coating the asbestos containing materials in a special resin to ensure the dangerous fibres cannot escape. Asbestos Testing - We provide a complete range of asbestos testing and sampling. This involves laboratory testing of any items you suspect may contain asbestos.